The earnings differential between men and women is a recurring topic in academic research and policy debates. While the gender pay gap is sometimes interpreted as a blatant sign of discrimination that calls for stricter equal pay legislation, the story is far more complicated. For example, women may have a preference for certain sectors, firms and jobs that pay lower wages. Women with children are more likely to interrupt their careers or work part-time. A look at several recent IZA discussion papers shows that these alternative explanations are given different weight, depending on the focus of the analysis and the data used. Using a decade of annual wage and productivity data from New Zealand, an IZA paper by Isabelle Sin (Motu Economic and Public Policy Research), Steven Stillman (Free University of Bozen-Bolzano) and Richard Fabling finds that gender differences in sorting between industries and firms, as well as gender productivity differences, explain just a small fraction of the wage gap. They also reject statistical discrimination as a relevant explanation because the wage gap does not decrease over time even as employers should realize that women are no less productive than men. The authors conclude that taste-based discrimination is the key driver of the earnings differential. According to the study, this notion is supported by the observation that the wage gap increases under favorable market conditions when employers find it easier to discriminate. The paper thus suggests that stronger enforcement of equal pay regulations could be beneficial for many women in New Zealand, but also in other OECD countries with similar labor markets. 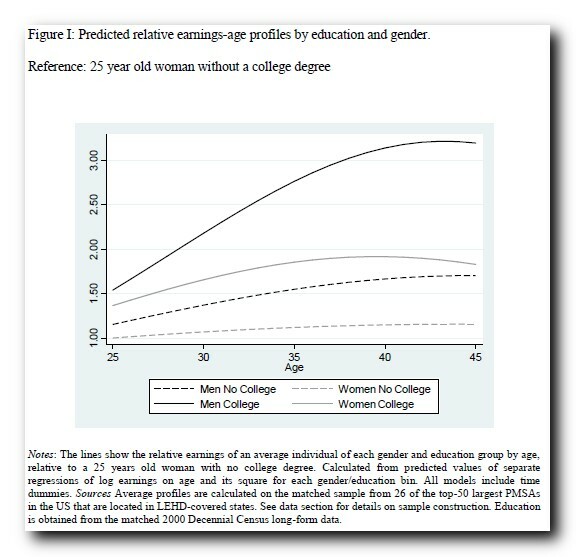 Intra-household decisions in favor of the husband’s career explain why the gender wage gap increases over the life course, as demonstrated in a recent IZA paper by Erling Barth (Institute for Social Research), Sari Pekkala Kerr (Wellesley College) and Claudia Olivetti (Boston College). This is particularly true for college-educated workers, whose earnings profiles tend to be steeper. In terms of higher pay, women tend to benefit less from career moves. The authors use U.S. data to analyze the relative importance of shifts in the sorting of men and women across establishments and differential earnings growth within establishments. They find that the within component is more important for college-educated workers, explaining three-fourths of their wage gap. The across component – the frequency and quality of job-to-job transitions ­– explains the last quarter for those with college education and the entire gap for those without. The gap is almost non-existent for single women. This may be because married women are often “tied movers”, accompanying their husbands who find a better job in a new city. Another consequence of the traditional household division of labor is that women are much more prone to part-time work, which typically carries a lower accepted wage rate than full-time work. However, the part-time wage penalty can explain less than 10% (only 3.3% for low-educated workers) of the gender pay gap, according to an IZA paper by Kai Liu (Norwegian School of Economics), meanwhile published in Quantitative Economics. Liu points out that men and women also differ in their job turnover dynamics: women are more likely to quit jobs for non-employment, and job changes for women more often involve changes in hours of work. Equal Pay legislation for part-time and full-time work would therefore do little to close the gender pay gap, also due to its behavioral impact on labor supply decisions. Instead, the study finds that Equal Protection policies aimed at equalizing the layoff probabilities for part-time and full-time workers would be more effective in reducing the gender wage gap, especially among low-educated individuals. So would women earn the same as men if there were no employer discrimination, no household division of labor, and no part-time wage penalty? Probably not, given that gender differences in the willingness to compete still affect career decisions and labor market outcomes, according to an IZA paper by Thomas Buser (University of Amsterdam), Noemi Peter (University of Groningen) and Stefan Wolter (University of Bern). 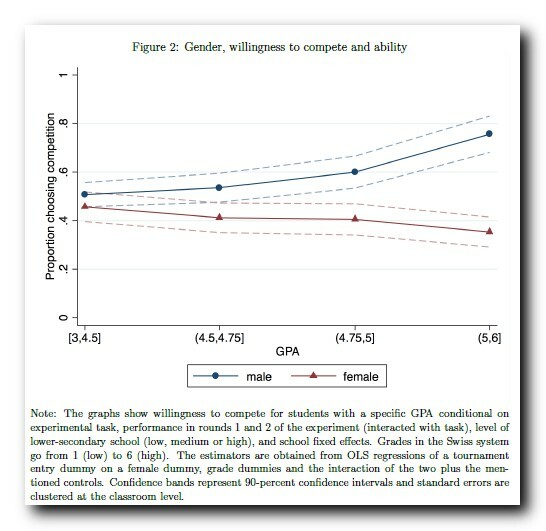 In an experiment with 1,500 Swiss 8th-graders, the authors find that the gender gap in willingness to compete is essentially zero among the lowest-ability students, but increases steadily with ability and reaches 30–40 percentage points for the highest-ability students. More competitive boys are more likely to choose a math or science-related academic specialization (high-ability boys) or a business-related apprenticeship (medium-ability boys), and are more likely to succeed in securing an apprenticeship position (low-ability boys). These findings relate to persistent gender differences in career outcomes. The above studies underscore that there are many drivers of the gender pay gap. While there is still disagreement about the major source of it, there is a growing consensus that policies to promote greater female lifetime work effort (e.g. 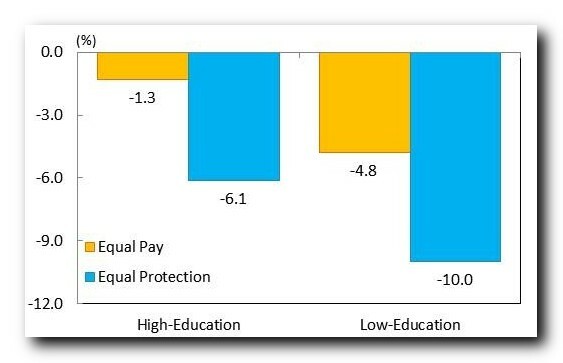 better childcare provision or lower marginal tax rates encouraging female labor force participation) are most effective at achieving more equal pay.